Scituate, located ~ 20 km southeast of Boston Harbor, is a coastal lagoon along the south shore of Massachusetts Bay. The harbor is shallow (average depth ~ 3 m) and aligned ~ north-south, with a northern basin (max. depth ~ 4.5 m) and smaller southern basin (max. depth 5.5 m). The Edward Foster Road causeway separates the harbor from a large marsh (called the Kent Street Marshes). The southern harbor is connected with the marsh by a shallow, narrow channel (width ~10 m, maximum depth ~1.7 m) (the text is copied from Beardsley et al., 2013). 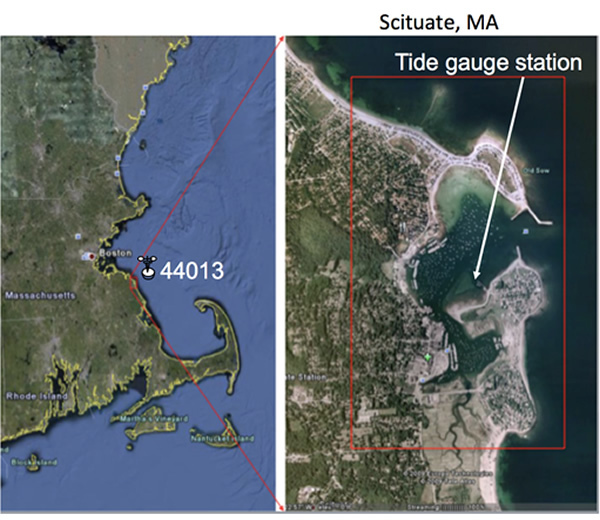 The NWS Weather Forecast Offices (WFOs) in Taunton (MA) and Grey (ME) selected Scituate as its first pilot site to improve its coastal inundation forecast capability. The Northeast Regional Association of Coastal Ocean Observing Systems (NERACOOS) was established in late 2007 as part of the NOAA-led US Integrated Ocean Observing System (IOOS). 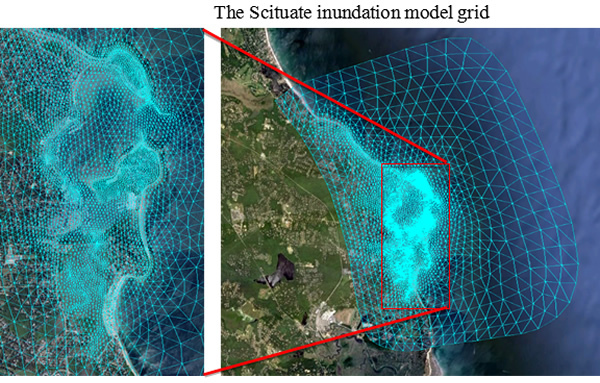 The Scituate inundation FVCOM domain is configured with sub-regional unstructured grid with a horizontal resolution varying from ~ 400-500 m over the shelf to ~ 10 m inside the harbor. In the vertical, a total of 10 uniform σ-layers were specified, with a vertical resolution varying from 1.5 m over the shelf to 0.1 m or less along the coast where the water depth is 1 m or shallower. The Scituate inundation FVCOM is driven through a one-way nesting to GOM-FVCOM and FVCOM-SWAVE with inclusion of wave-current interactions. The forecast variables include: sea level, wave height, wave frequencies/periods, three-dimensional water currents.